The Gulf carriers at a watershed? For over two decades the Gulf Carriers have been front and centre of dramatic change in global long haul markets. The underpinnings of this opportunistic and creative expansion had been threefold: a near perfect geographic centrality, the arrival of new generation large aircraft with low unit costs and a more liberal attitude towards market access. All this was greatly aided by coherent aviation policies, something sadly lacking in most national administrations. At the same time, the remainder of the Middle East was largely constrained by much more restrictive internal access regimes. 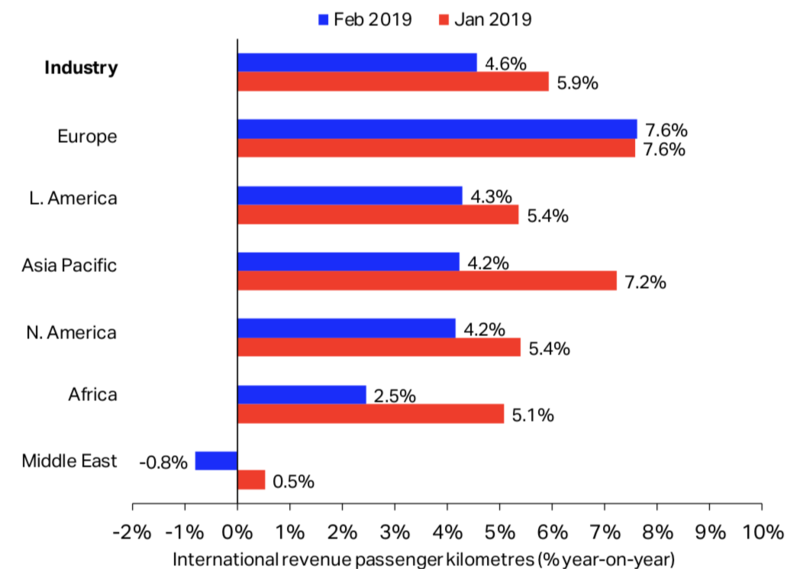 According to IATA data, in Feb-2019 the Middle East was unique worldwide in actually going backwards in terms of year on year revenue passenger kilometre growth. Like most statistics, this does need some qualification. There is increasing activity in short haul markets, but there has clearly been a wind change. Today, as the region's long haul growth is lagging, new hope for growth emerges, as major markets like Saudi Arabia start to open up. After years of being the world’s focus for airline growth and innovation – as well as attracting lots of attention from airlines who felt threatened – growth by the Gulf carriers and the Middle East as a whole has become becalmed. The IATA graph below demonstrates clearly just how out of step the region has suddenly become. Emirates Airline, whose remarkable model and expansion profile reshaped global aviation, is one very important element in that reversal of form, as its growth tapers. 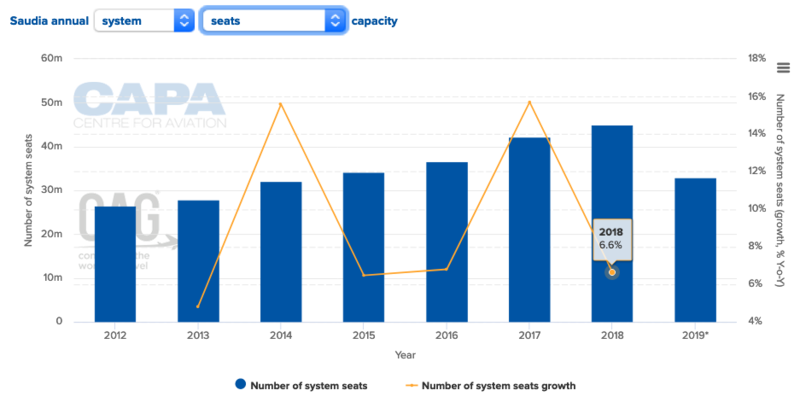 Etihad, for several years actually the fastest growing (from a smaller base), has dramatically changed strategic course over the past two years, following setbacks with Air Berlin, Alitalia and Jet Airways, and has actually reduced its seat numbers in 2018. Of the Big Three, only Qatar Airways, constrained by a blockade, has proceeded with its growth. 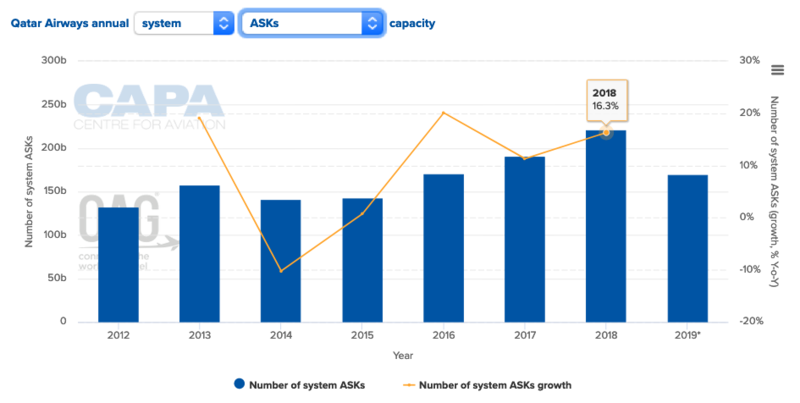 Capacity was up 6.8% y-o-y in 2018. 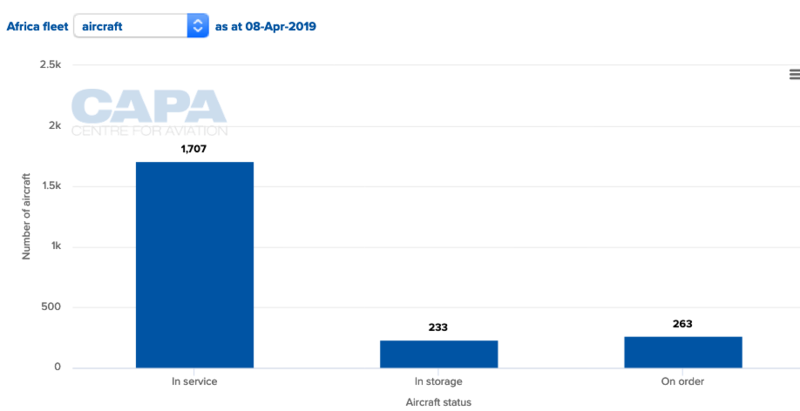 But Qatar’s ASK numbers rose a much higher 16.3% - and similar expansion is continuing in 2019, as new routes open up and existing routes are thickened. Saudi Arabian aviation, home to the biggest market in the region, is meanwhile starting to move ahead on a wide front. Saudia, growing solidly over the past four years, now has a fast expanding LCC subsidiary, flyadeal; the LCC has 30 737MAX aircraft on order. 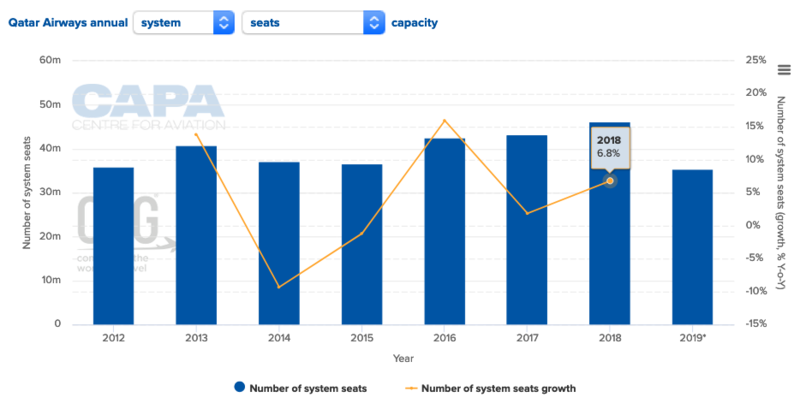 Unlike its near neighbours, Saudia does not have significant longhaul widebody aircraft growth plans, although its 39 777s have a median age of only 4.3 years and its 32 A330s an even younger median of 2.4 years, which entrench it well in long haul markets. Something of its forward route planning can also be seen in its order for 14 long range narrowbody A321-200neoLRs and another 20 A320-200neos. 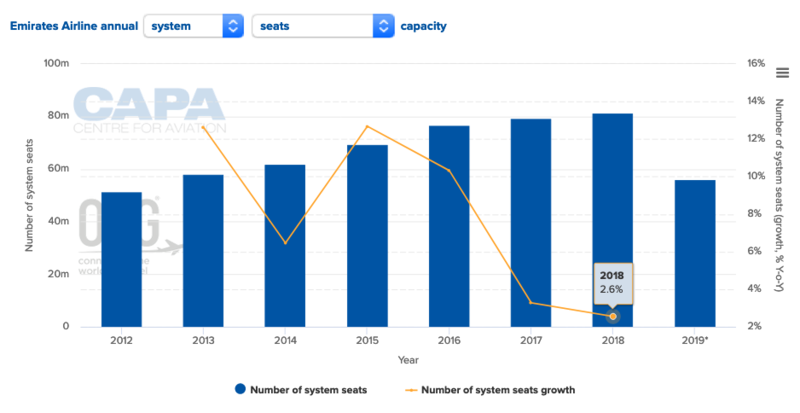 Perhaps the fastest growth prospects however is apparent in the order book of Dubai-based flydubai, with 237 narrowbody Boeings on order, of which over 100 are due for delivery by the end of 2023. 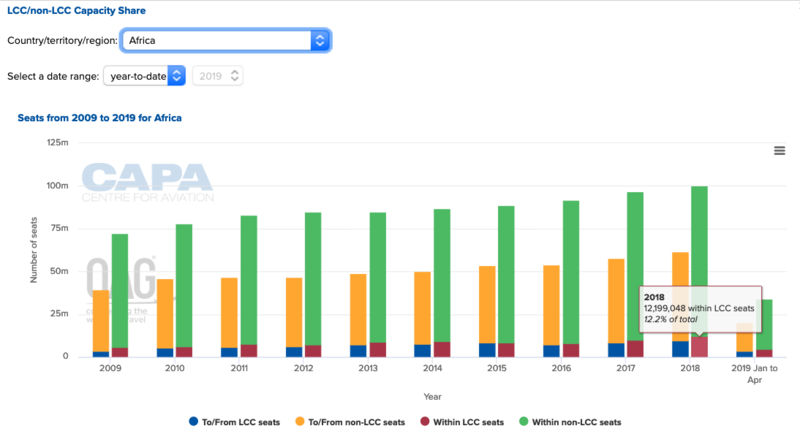 Most markets around the world have moved to a profile with a proportion of LCC operations in the region of 20-40% of total seats; some domestic markets, like India and the Philippines, are well above that level. The Middle East and Africa have lagged. 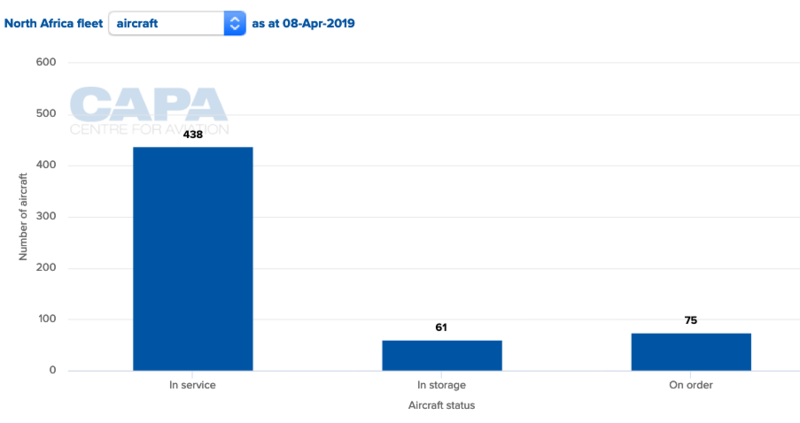 The penetration of markets by LCCs can be seen in many ways as an indicator of the state of advancement in intra-regional connectivity. In these terms, Africa either has enormous potential – or is simply condemned to being under-connected. While the expansion of Middle East LCCs over the past decade has been consistent since the establishment of first mover Air Arabia in 2003, it is now accelerating and about to blossom, at least, based on the number of aircraft orders from this sector. The Middle East region’s main LCCs between them have a solid order book of over 350 aircraft for delivery: flydubai (237 of Boeing’s 737s – of which 121 are MAXs); Air Arabia (6 A321s); flynas (78 A320neos); flyadeal (30 737MAXs). The same is not the case in Africa however, where the substantially smaller fleets are either diminishing, or growing only slowly. The following table summarises LCC sizes in each region. Notes: fastjet was established as a pan-African LCC group and initially launched in Tanzania in 2012 but fastjet Tanzania suspended operations in late 2018; the group’s affiliate in Zimbabwe, which launched in 2015, is still operating and fastjet also still operates services in Mozambique using a wet leased aircraft (not included in this table). FlyEgypt launched in 2015 but initially operated as a charter airline and began scheduled services under an LCC model in 2016. Africa is many markets, but with only one or two major exceptions, there has been little positive movement recently. Partly this is due to the usual nationalistic hubris that surrounds airlines, but also to a shortage of funding – which in turn can be attributed to the uncertainty of local markets and the persistent, often unhelpful, intervention of national governments. For Africa as a whole the picture is similar, with order accounting for approximately only one sixth of the total existing fleet size. Needless to say, this does not augur well for future expansion. To give an extreme contrast, the number of aircraft orders in SE Asia is larger than the number of aircraft in service. the Declaration and Framework for a Plan of Action for Development of Aviation Infrastructure in Africa. But words, declarations and good intentions do not translate easily to reality – particularly where almost every barrier imaginable stands in their way. ICAO’s Dr Aliu listed the multitude of constraints on growth, “including capacity crunches at many African airports, the related lack of finance and investment for infrastructure development and modernisation, persisting skilled education and training capacity gaps, and in some jurisdictions ill-conceived market, taxation, and visa facilitation regulation.” He could, less diplomatically, have said “in most jurisdictions”. All the resolutions and conventions in the world are not going to address that litany of hurdles to growth. 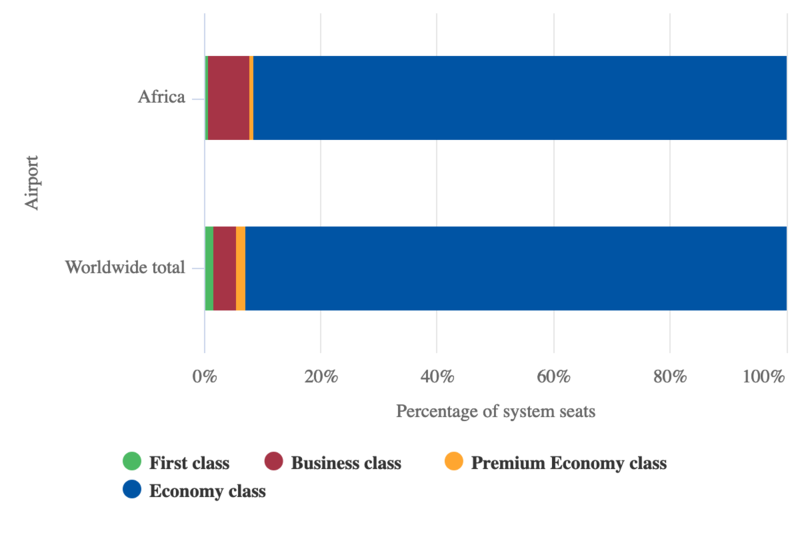 The pre-eminence of wide body long haul over short haul internal Africa operations is apparent from the very high relative proportion of premium seats on Africa routes, almost 8% of total. Stated differently, this again illustrates how few short haul operations there are compared with other markets. 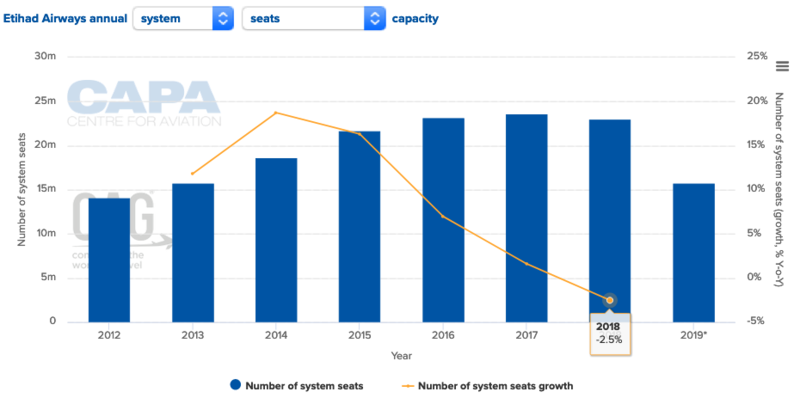 Short haul services tend to be predominantly economy seating; so for example, in Western Europe the proportion of premium seats is just over 5%. Whatever their current trajectory, these are relatively fresh markets, where potential is ubiquitous. The usual culprits of nationalism and bilateral limits on ownership continue to distort markets whose economies are patently much better served by liberalisation. The Middle East is much better equipped to move ahead. But, with Africa particularly, gradual change is not going to provide the jolt necessary to provide a platform for serious growth. Unless this roadblock is disrupted, the consequent stagnation of airline industries will help condemn many nations in the region to underdevelopment and an absence of foreign investment. The CAPA Middle East & Africa Aviation Summit will bring an expected delegation of 250 senior executives from airlines, airports and industry suppliers to Dubai on 29/30-Apr-2019 to examine the commercial and operational issues affecting airlines and airports in Africa and the Middle East. The Summit will attract industry thought leaders to explore domestic and international market growth opportunities, discuss infrastructure constraints, examine the airline and airport relationship and investigate emerging technologies. Kenya Airways Group MD and CEO Sebastian Mikosz. South African Airways Group CEO Vuyani Jarana. Day 1 panels include a Spotlight on Middle East carriers and the outlook for 2019 and 2020. Panellists including Gulf Air CEO Krešimir Kučko and Jazeera Airways CEO Rohit Ramachandran will discuss the impact of regional politics on aviation regulation in the Middle East, where capacity growth slowed and competition increased in 2018. The panel will consider how the region’s smaller carriers can differentiate themselves and compete against the big three; the lessons to be learned from airport privatisation; the right product proposition for the region; strategies to address unique regional distribution challenges; and how to reconcile the objective of open skies with creating markets for national carriers. Air Arabia CEO Adel Ali and flyadeal CEO Con Korfiatis will join a panel on the lessons to be learned from the experience of LCCs in Africa and the Middle East. Africa remains an extremely challenging market for LCCs and start ups, while questions remain over the sustainability of the LCC model in the Middle East. Panellists will consider whether Africa is ready for more LCCs and whether the cross-border LCC model can succeed in the region. The Spotlight on Africa panel will include the chief executives of two of the continent’s largest carriers, Kenya Airways Group MD and CEO Sebastian Mikosz and South African Airways Group CEO Vuyani Jarana, who will examine the outlook for Africa, which remains a market of huge potential but even greater challenges. The African airline sector continues to struggle, with foreign carriers holding a huge competitive advantage, and now faces the additional challenge of new start ups entering the market. The Day 1 agenda also includes a panel on airport and airspace infrastructure, featuring Aviation Minds managing partner Nadine Itani and London Stansted Airport CEO Ken O’Toole. Infrastructure constraints in Africa and the Middle East are having a major impact on aviation. With population growth and travel demand on the rise in Africa, the number of airport construction projects is growing accordingly, with a level of ambition to build modern, efficient and future-oriented facilities. Large airport projects in the Middle East are nearing completion, including in Kuwait, Dubai, Saudi Arabia and Iran. The panel will review the role of the airport-airline relationship; lessons to be learned from the rest of the world; how to unlock slots at congested airports; and whether Middle East airports and air navigation service providers have the capacity to accommodate the ambitious growth goals of the region’s carriers. Day 2 panels feature an examination of the forces driving travel and tourism demand. Areas of discussion will include the main inbound tourism source markets for Africa and the Middle East and which of these are key for international growth. The panel will also examine how super-connector airlines can drive local tourism growth from their existing transit passengers. flyadeal CEO Con Korfiatis will return on Day 2 for a panel on short to long haul connectivity and the expansion of long haul LCCs. Panellists will consider whether short to long haul partnerships can disrupt the operations of established long haul network carriers and whether self-connecting platforms and virtual interlining can really be seamless. The panel will also examine the role of airports, the markets in which short to long haul LCC partnerships are likely to proliferate and whether long haul low cost airlines can be successful as standalone entities without short haul partners. As carriers in the Middle East face ongoing challenges to their business models and protectionist barriers continue to inhibit growth in Africa, the CAPA Middle East & Africa Aviation Summit will bring together senior airline and airport leaders from across the region to tackle the critical issues.